Our Wireless Station is a unique technology in the chess world, as it makes the live transmissions available without any cables towards the PC. Finally, the organisers don't need to lay down hundreds of meters of cables on the floor! 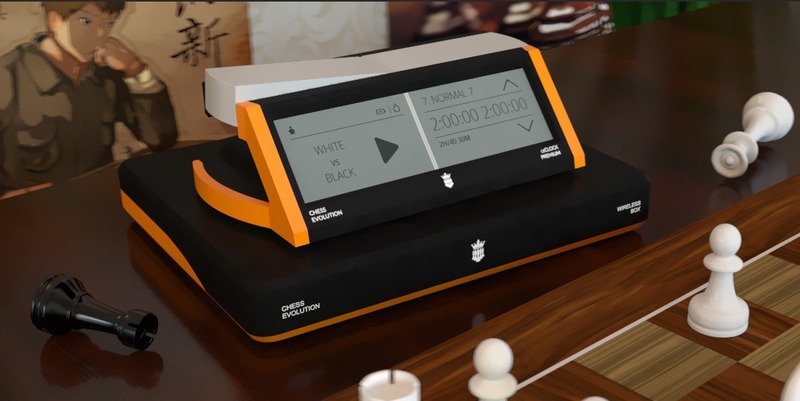 It is the only working WiFi chess set in the world compatible with our digital chess set (CE E-board & CE E-pieces) and our CE Premium clock or CE Classic clock. The Wireless Station is located under the Premium clock (see picture) and can be bought for the Premium clock additionally as an upgrade to WiFi transmission. The accumulators inside are charging the clock and the E-Board as well and they have 70+ operating hours, which is more than enough to broadcast a full tournament with only one charge! The charging time of the Wireless Station is only 2 hours. It is working in 50+ meters distance from the PC or the router.